Explanation: Have you ever seen an entire rainbow? From the ground, typically, only the top portion of a rainbow is visible because directions toward the ground have fewer raindrops. From the air, though, the entire 360 degree circle of a rainbow is more commonly visible. 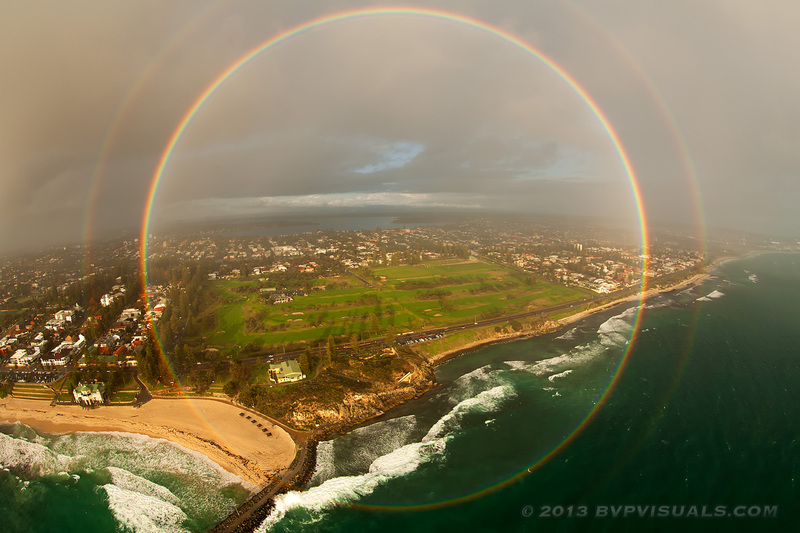 Pictured here, a full circle rainbow was captured over Cottesloe Beach near Perth, Australia last year by a helicopter flying between a setting sun and a downpour. An observer-dependent phenomenon primarily caused by the internal reflection of sunlight by raindrops, the 84-degree diameter rainbow followed the helicopter, intact, for about 5 kilometres. As a bonus, a second rainbow that was more faint and colour-reversed was visible outside the first. APOD Astrophotographers: Has your work ever been used for scientific discovery?